Creativity is one seemingly mysterious force, which we long to understand and develop. 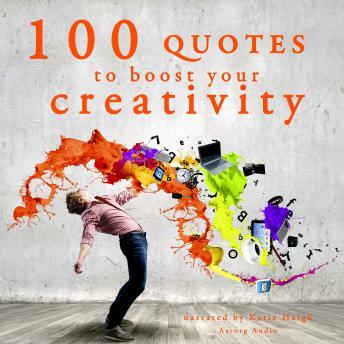 We have selected for you 100 quotes from the greatest thinkers, artists and creators, for you to get strength and inspiration in your own life. Nourish yourself with the experience and reflection of the greatest authors: Nietzsche, Flaubert, Hemingway, Henry David Thoreau, Picasso, Banksy and so many others. Each one of them will give you food for thought, boosting your creative powers and providing you with a new understanding of the act of creation from an artistic and philosophical point of view. Develop your understanding and boost your creativity with the help of the best minds ever!